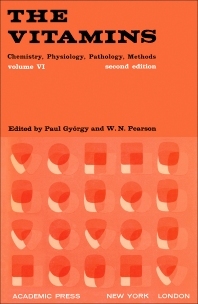 The Vitamins: Chemistry, Physiology, Pathology, Methods, Volume VI, Second Edition emphasizes the chemical, physiological, pathological, and methodological aspects of vitamins. This volume contains six chapters that describe the application of biological assays in vitamin analysis. The opening chapter presents the methods for quantitative estimates of vitamin's potency and reliability, followed by descriptions of the design and statistical analysis of vitamin assays. The remaining chapters deal with the chemical, physicochemical, and separation methods of vitamin A, D, K, and E. This book will be of value to nutritionists, dieticians, food scientists, technologists, and researchers.